Alcohol Industry today has transformed a lot from branding to advertising & great quality to competition. A lot has changed in the last decade. With Brand competition to race of best quality with best price has become the buzz of the market. But although all these changing trends it has been a very fast growing industry. It is observed that great change has derived in the way food, beverages, liquor, wine, beer, cider, spirit labelling standards have changed internationally with food& hygiene instruction & protocols which are mandatory to follow while making labels. These labelling machineries are also utilized for cider bottle & fruit juice bottle, spirits & vinegar labelling solutions. Why is it different for alcohol industry? It is different in wine industry due to its characteristics of labelling. Liquor bottle labelling is very different due to ever changing climatic conditions. There are many a times great challenges due to packaging conditions which varies from country to continents. Also American, European, Asian & other law & enforcement on advertising influences a lot on how the Liquor, Alcohol , Vodka, Whisky bottle labeling machines. Ability to apply different types of liquor bottles recalibrations and sizes. There are truly many factors which play role so, it’s always wise to choose the correct, accurate & liquor labelling machine with advanced technology. Why choose Indian Liquor & Alcohol Labelling Machine? 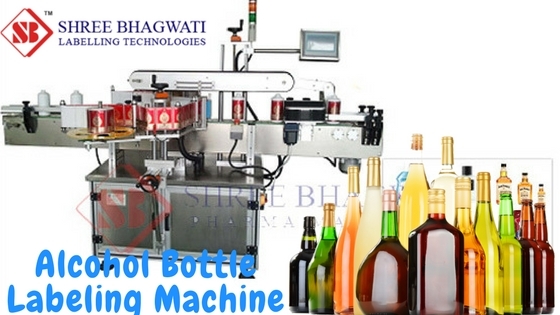 With the aim of making the best efficient & high in performance alcohol bottle labelling machine. Indian alcohol bottle labelers are widely popular for affordable labelling machines company name has a renowned name in industry. Indian Alcohol Bottle Labeling Machine Manufacturers can deliver the best clarity and perfection too with the most compatible prices.